When setting up your new home things can become expensive, especially when it comes to the kitchen. You need a durable set of pots and pans to make the best cuisine. Purchasing a full collection costs a fortune but is a kitchen essential. 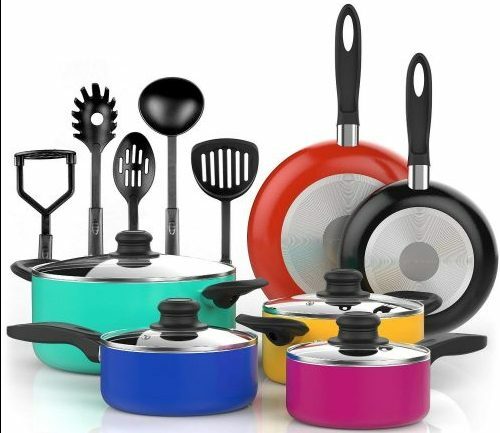 We have selected the best affordable cookware sets saving you time and money. With the range of pots and pans, you can make your kitchen look stylish and enjoy healthy cooking at the same time. Look at the budget-friendly options and pick a set according to your baking needs. The lids of the WearEver pots and pans perforated to make draining of liquids easier. The pans distribute heat evenly and have built-in pour spouts. The ergonomic handles comfortable in hand, and you receive a stainless steel colander in the purchase. With the steel finish, it fits in with any kitchen décor, and you can use the pans in the oven. 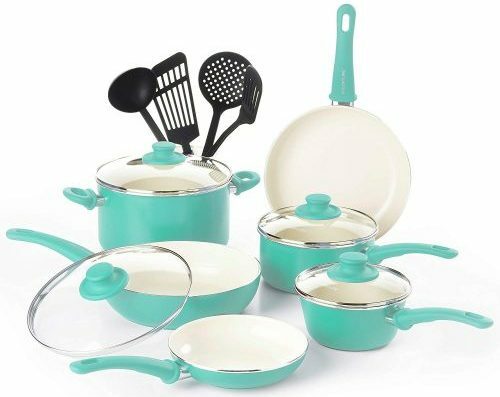 With this affordable cookware set, you can add some color to your kitchen. The vented glass lids fit secure without letting out the nutrients. The constructions aluminum and the handles have built-in holes for hanging. 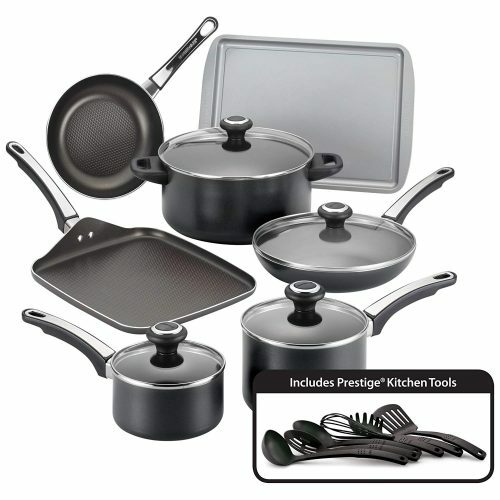 For the fantastic price, you get a 15-piece set to start up any kitchen. 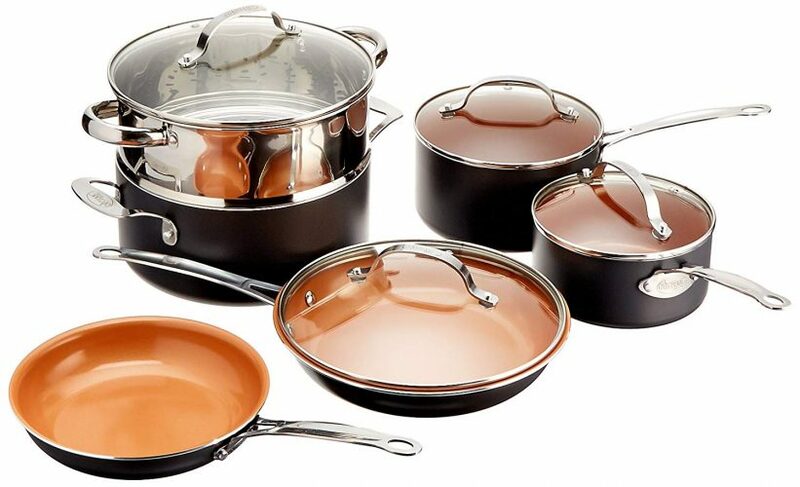 Another affordable cookware set you can look at is the Cuisinart Chef’s Classic collection. The pots and pans got you covered to cook up different foodstuff at the same time. The tight-fitting glass lid ensures that no moisture goes lost. The rims tapered for pouring and the handles remain cool when touched. The frying and saucepan have outstanding heat indication and turns red when hot. 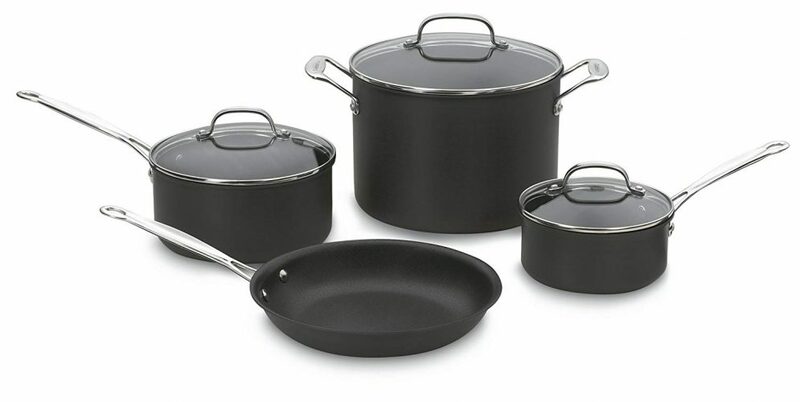 The handles remain cool to touch, and the cookware has a hard-anodized exterior. You can use it with metal utensils, and you receive extra a spoon and spatula. When it is time for you to prepare the Thanksgiving dinner, you need the affordable cookware set from Farberware. You can tackle any cooking task with the 17-piece set. Included you receive a cookie sheet and a range of utensils. The pots are a bit small and have a dimpled surface. You can buy the affordable cookware set from Paula Deen in six stunning shades. Included you receive measuring spoons and the pans have heat distribution. For storage, it stacks in each other to save space. The handles are soft to touch and remain cool. The glass lids have copper plated knobs to add sophistication and color when displayed. 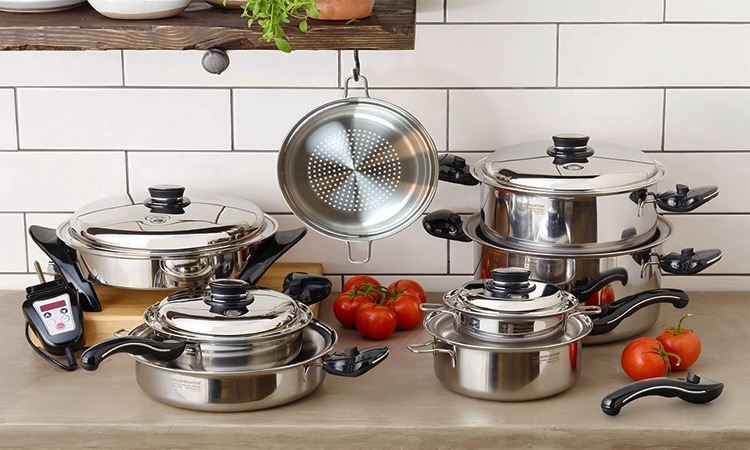 The affordable cookware set in the Gotham Steel Ti-Cerama range is stunning. 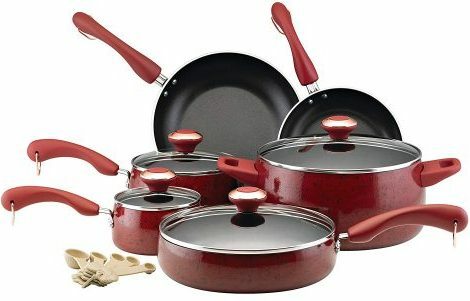 The pots and pans have a titanium construction with a ceramic finish and entirely rust-resistant. The product is not dishwasher safe and not suitable for use with induction cooking. The pot and pans from BulbHead are oven safe and great for braising meat. You receive a steamer insert, and the lid handles are on the thin side. To make up for the construction, you receive a limited lifetime warranty included. Furthermore, the pots and pans covered with a glass lid. 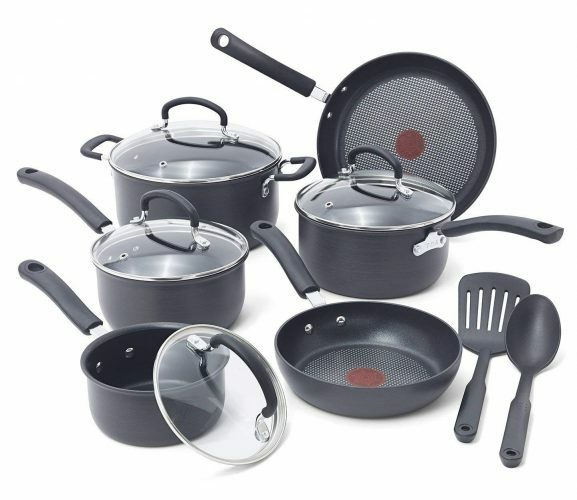 The GreenLife affordable cookware set offers you the latest nonstick design and eco-friendly at the same time. The soft grip handles fit comfortably in your hand. The fantastic thing is you can bake your eggs without water or oil. The only complaint is the inside stains easily. 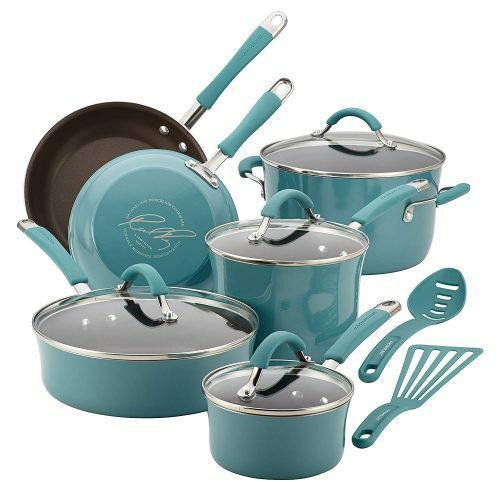 A culinary sweetheart loved by all chefs is the affordable cookware set from Rachael Ray. The Cucina has a non-stick finish with non-slip handles and break-resistant glass lids. The exterior has a glossy enamel finish to fit in with any kitchen décor. The pots and pans are oven safe and suitable to use on most stovetops except induction. You do not need to spend a fortune on kitchenware with the best affordable cookware sets reviewed here. Whether you plan to make a light, healthy meal to sit-down dinner, each set of pot and pans on the list can help. The collections are made of durable material and easy to clean and use.